To continue with the sports theme from yesterday, today we have an interactive map from Twitter that looks at NFL team popularity. 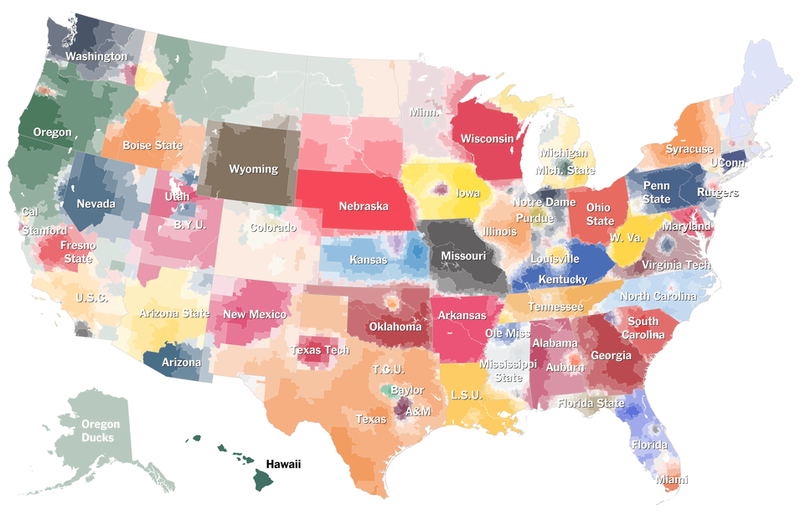 The methodology is simple, where are the users following the various football teams and map that out by county. The overall blog post features a country-wide map, but then narrows down into a few particular stories. The image below is from the divide in the state of Pennsylvania between Eagles fans and Steelers fans. Credit for the piece goes to Simon Rogers and Krist Wongsuphasawat. 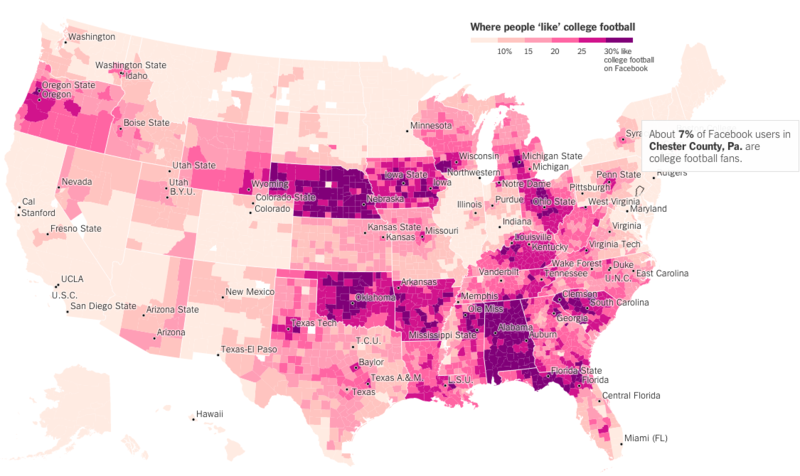 A couple of weeks ago I shared a map from the New York Times that looked at American college football programme loyalty. And I quipped that none of it made sense to me as someone born and raised in the Northeast. The New York Times followed that piece up with another that looks solely at Facebook likes of college football via likes for any team. Not surprisingly the sport does not do too well in the Northeast. But it does appear quite popular in other regions of the country. Credit for the piece goes to Neil Irwin and Kevin Quealy. Credit for the piece goes to Tom Giratikanon, Josh Katz, David Leonhardt, Kevin Quealy, and Marc Tracy. Two weekends ago Eli Manning’s brother accomplished a feat in American football. And it was not in Indianapolis. The New York Times documented the story in an interactive article. In fairness, I generally do not follow American football. I am largely a one sport person and that sport is baseball. But since the active baseball season is over—baseball ends when the Red Sox stop playing—I figured the rest of you might enjoy this. Credit for the piece goes to Gregor Aisch and Kevin Quealy. The Best Superbowl Match-up Ever? Last night the United States enjoyed a little (American, not rest-of-the-world) football match wherein two squadrons competed upon the pitch for the glory of their squadron colours. Thankfully for those of us who wanted a preview of the match on data’s terms, well, the Guardian put together a fantastic piece breaking down some of the numbers. The data is not terribly complicated—I still think baseball makes the most use of advanced metrics, though it helps they play more than 10 times as many games per season. The Guardian looked at yards gained or lost per play by the offence or defence, respectively. Click through the link to explore the other charting forms used, in particular the four quadrant scatter plot and the small multiples that follow. 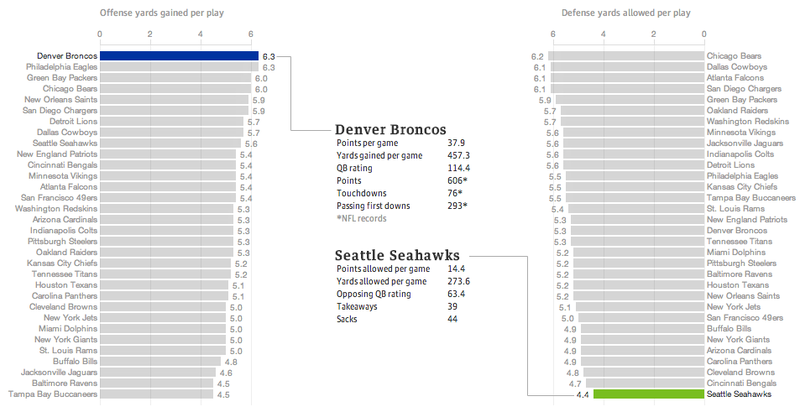 Also, a sophisticated and restrained colour palette allows the user to clearly understand when he or she is viewing the Denver–Seattle matchup or the historic match-ups of the NFL. Regardless of the quality of the presentation, we shall see Monday morning—I am writing this Sunday afternoon—whether this piece will still hold with its talk of the best match-up ever. And hey, for all this talk about the best offence, look at which squadron is ranked second. Fly, Eagles, fly. Credit for the piece goes to the Guardian’s US Interactive Team. Author Brendan BarryPosted on 3 February 14 11 November 16 Categories InfographicTags bar chart, charting, data visualisation, diagram, football, Guardian, infographic, information design, interactive design, sportsLeave a comment on The Best Superbowl Match-up Ever? This weekend we will have yet more football. My preferred team, the Philadelphia Eagles, is of course now out of contention. But more than likely, the coach’s job is secure for at least another year. As we have already seen, however, that cannot be said for other coaches. 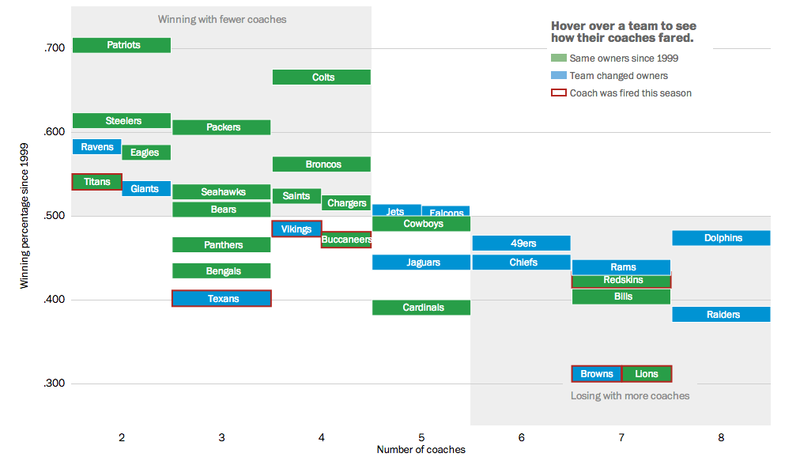 So the Washington Post looked at ownership’s role in the success of their respective team by the hiring and firing of coaches. Credit for the piece goes to Bonnie Berkowitz, Darla Cameron, Dan Keating, and Rick Maese. Well, travel for the teams, not you. It’s a big issue in Brazil because unlike the last couple of times, the teams need to travel big distances to reach the cities where they play their matches. Thankfully, to explain just how far some of these distances are for some of these teams, Quartz put together a nice article with quite a few graphics. 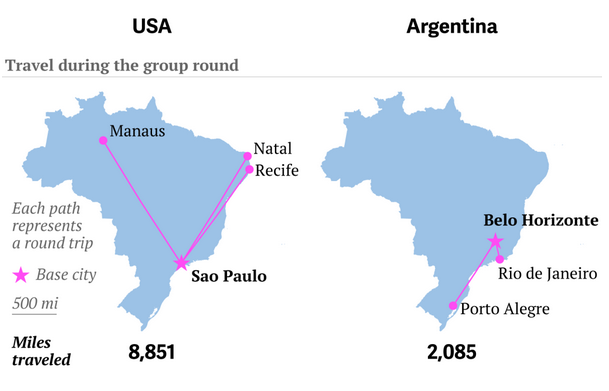 This graphic in particular juxtaposes the travels of the US team and the Argentinian team. Who do you think has it easier? Credit for the piece goes to Jason Karaian and Ritchie King. On Sunday night the Denver Broncos played the New England Patriots. The contest sported two of the game’s best quarterbacks: Tom Brady and Peyton Manning. 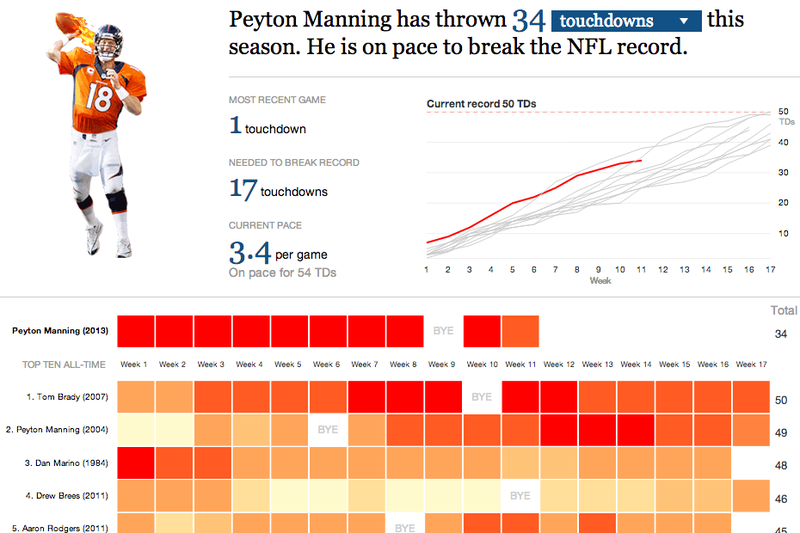 This interactive graphic by the Guardian detailed how, in this season alone, Manning is putting up record numbers. Credit for the graphic goes to the Guardian US interactive team. 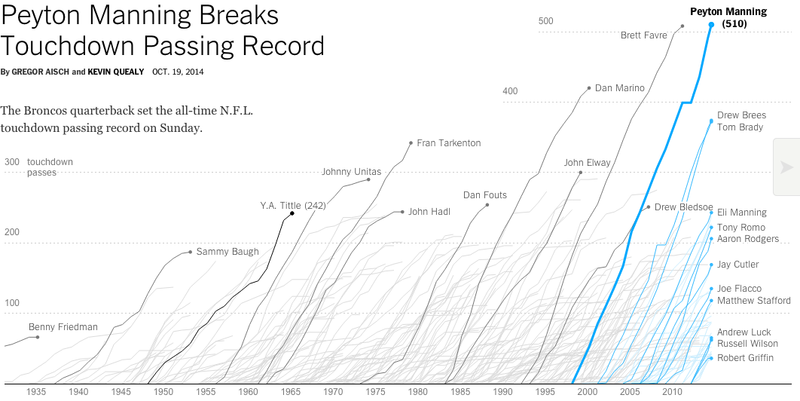 This graphic comes from the New York Times from an article looking at the sports network ESPN. Specifically, the article focuses on the network’s strategy of working with smaller schools desiring national attention to fill in open spaces on their weekly broadcast calendar. 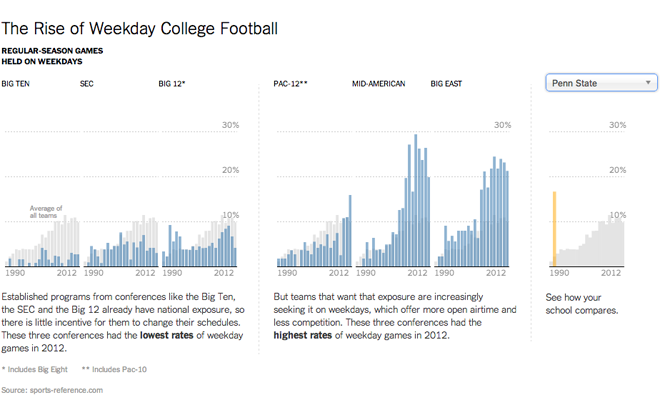 In short, weekday nights are not big nights for college football; usually people watch their alma maters on Saturday. But, if your school is willing to make schedule adjustments, ESPN is apparently willing to throw you some money. This interactive bar chart looks at whether your alma mater (or in my case the only university I attended that had sports—yay art school) has begun to play weekday games.